Wang announced on his Sina Weibo account early Sunday that he is ending his seven-year marriage to Ma Rong after she had an affair with his agent, Song Zhe. He sued Ma on Monday, alleging that she had transferred their joint assets. On Sunday alone, 10,629 articles on popular news application Jinri Toutiao, or "today's headlines," surfaced, 106 of which each attracted over 1 million views, according to Jizhezhan, a WeChat account that focuses on the news industry. As more information was exposed, including Ma's claims of Wang's alleged extramarital affair on Tuesday afternoon, most netizens stayed glued to the family dispute. Over 2.1 million posts on Sina Weibo were about Wang on Wednesday, making it by far the hottest topic over the stunning victory of China's women's volleyball team over Brazil in the quarterfinals. The volleyball topic only attracted 118,000 posts. Most netizens expressed their support for Wang and contempt for his wife - more than 4.49 million mostly critical or sarcastic comments were left on Ma's post as of Wednesday, one of the largest number of comments on a single Weibo post. A Hebei Province farmer's son who rose to stardom in 2004 after starring in the film, A World Without Thieves, Wang received overwhelming support and sympathy from Net users for his rags-to-riches story, said Steven Dong, an Academy of Media and Public Affairs professor at the Communications University of China. His predicament was also attributed to a mismatched marriage - between a beautiful college-educated woman and a rich but homely man, consistent with the mainstream Chinese belief that a couple should be a match in every aspect to maintain an enduring relationship, including social status, educational background, income and physical appearance, Dong said. However, Yu Guoming, deputy dean of the School of Journalism and Communication at the Renmin University of China, said he sees interest in the topic from a broader perspective. 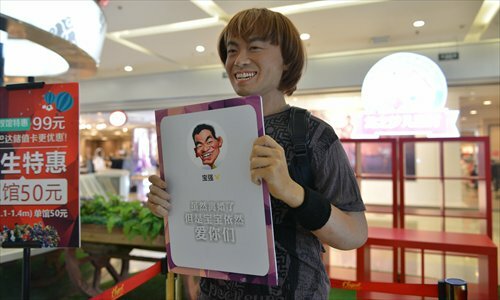 "The topic offers the Chinese almost unchecked freedom to discuss and dig into whatever details they are interested, in contrast with sensitive political topics," Yu told the Global Times, adding that people needs to have fun as well because of the tremendous pressure amid the country's continuing economic downturn. But the issue was largely ignored by mainstream media. The divorce case has evolved into such a dramatic story, including financial conspiracy and unfaithfulness angles, that mainstream media's coverage would have made it too serious, Yu said. Nevertheless, Dong called on the mainstream media to end the netizens' obsession with the topic. "Since the court has received the case, Net users should stop acting as judge and jury," Dong said, adding that public pressure will undermine the authority of the law if the hearing fails to conform to their expectations.